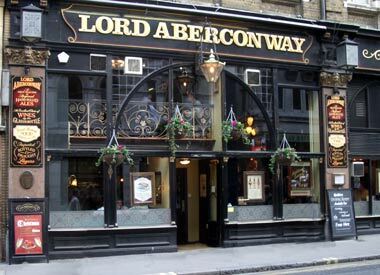 Just across the road from Liverpool Street Station (the McDonalds entrance) and opposite The Railway pub you will find the Lord Aberconway. A traditional style pub, as you would expect from Nicholson's with well kept beer. London Pride, IPA, Timmy Taylor and guest beers along with Staropramen, Amstel and Guinness are all reasonably priced and delivered promptly even when busy. The full menu range of food is also available. There are half a dozen tables and chairs on an upper balcony, which is an excellent spot if you are lucky enough to find one free. Downstairs is the bar and some varied seating, along with a couple of booths for groups of four. On the wall, to the left as you enter, is a large Royal Coat of Arms, the official coat of arms of the Queen. In the 70's book, City of London Pubs, a practical and historical guide by Timothy M. Richards & James Stevens Curl, 73 Old Broad Street is described as "Patmac's Railway Buffet - Essentially, as its name suggests, Patmac's is a buffet bar for Liverpool Street Underground station. The bar itself, with a separate snack counter is similar to many railway buffets, with a balcony overlooking the Victorian surroundings to add a touch of character. Old Broad Street was so called because it was one of the widest streets in the City, until the middle of the 17th century the street was also one of the most fashionable areas of the City.